No need to install it at all. Herebelow, find step-by-step instructions on how to download, extract and use the portable version of Azhagi+. Click here to download 'AzhagiPlus-Portable.zip' file. This is a very small file (less than 1 MB). Navigate to the folder in which you have downloaded 'AzhagiPlus-Portable.zip'. Extract the contents of "AzhagiPlus-Portable.zip" into a folder of your choice. After extraction, you will see a directory named "AzhagiPlus-Porto". You can copy that folder and paste it in any other normal, non-system folder. For e.g., you can paste it in a folder like "C:\MyFavoritePortableApplications\". But, you shall not paste it in system folders like "C:\Program Files (x86)". If you already have an earlier version of Azhagi+ (10.25, 10.24, etc.) in your system, kindly uninstall the same. If you had not used any earlier releases (10.25, 10.24, etc.) of the non-portable version of Azhagi+ so far, it is better you download and install the current non-portable version of Azhagi+ available at azhagi.com/index.html#download-azp once and then uninstall it immediately. If you open the "AzhagiPlus-Porto folder", you can see some "Folders and Files" inside it. Of these, there will be a file bearing the icon of AzhagiPlus. Click the same. For better understanding, kindly see the screenshot below. Now, Azhagi+'s starting screen will get displayed, as shown below. Please do not click on any of the buttons, etc. which you see on Azhagi+'s starting screen. Just minimize the screen. Please do not close the application. Now, you can open any external application (MS-Word, Excel, Notepad, Wordpad, Gmail, etc., etc., etc. 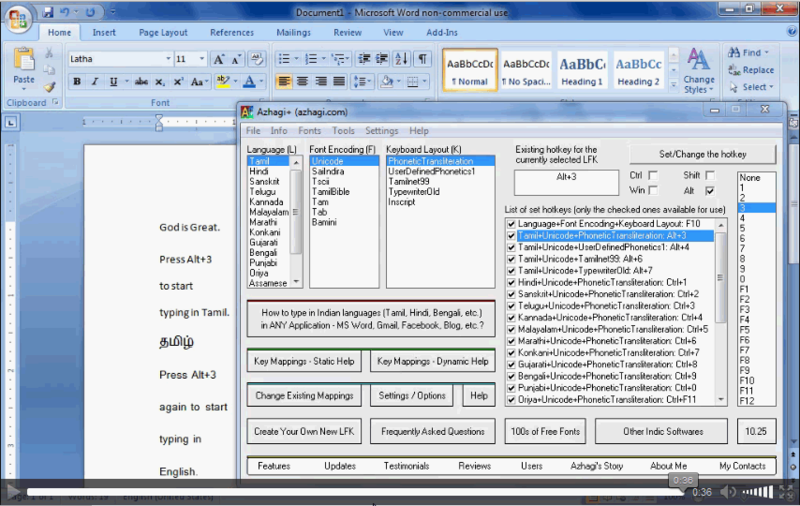 ), press Alt3 (or Alt4) in that application's usual editing area and start typing in Tamil. That is all to it. So simple. Isn't it? And, as you keep typing in Tamil, if you wish to type again in English, just press the same Alt3(Alt4)##. Immediately you can start typing in English. It is that easy. There is a small video demo (36 seconds only) too, here, showcasing this very simple procedure. Well, if you know Indian languages other than Tamil and wish to type in them too, it is easy again. As you keep typing in English (or Tamil), if you press Ctrl1, you can start typing in Hindi. If you press Ctrl2, you can start typing in Sanskrit. Ctrl3 - Telugu, Ctrl4 - Kannada, Ctrl5 - Malayalam, Ctrl6 - Marathi, Ctrl7 - Konkani, Ctrl8 - Gujarati, Ctrl9 - Bengali, Ctrl0 - Punjabi, CtrlF11 - Oriya, CtrlF12 - Assamese, Alt1 - SaiIndira, Alt5 - TamilBible, Alt7 - Old Tamil Typewriter, Alt6 - Tamilnet99, and so on. Truly speaking, you can extend Azhagi+ to type in ALL the world languages. This is possible using a very special feature of Azhagi+. To get details on the same, visit this page. You may also join Azhagi's Facebook Group and see this post. (##) In order to type using Azhagi's phonetic transliteration scheme (it's very easy, natural, intuitive and flexible), Azhagi+ users press Alt3 only always. Only if you are already accustomed to the phonetic scheme of softwares like 'NHM Writer', 'eKalappai', etc., you have to press "Alt4". i.e. "Alt4" only is your hotkey always. Not Alt3. Please keep this in mind. If for some reasons^^, pressing Alt3 (Ctrl1, etc.) is not working at all, then use the 'global hotkey F10' to type in Indian languages. (^^) One of the reasons could be that you changed the default hotkey (e.g. Alt+3) to some other hotkey, by mistake or without your knowledge. To set a hotkey back to it's default value, please see this section. One other reason could be that you (as a senior citizen) are not knowing how to press a combined key like "Alt3". Yet another reason could be that you are using the number pad to press '3'. If so, you should not press '3' from the number pad. You should press the regular '3' which you find at the top row of number keys (below the function keys). i.e. you should press the '3' under the '#' sign. If you face any other issues while using Azhagi+, please see this CHECKLIST first. And, if you are using Windows XP, then please read this, without fail. Azhagi's "English-to-Tamil Phonetic Key Mappings Table" can be seen here. The full list of key mappings for all languages can be seen here. The basic steps needed to start typing using Azhagi+ are just the above alone. Nevertheless, if you read the important notes, useful tips and additional information given below, that would be of great help to you. Even if you feel that you may not need these info, somebody else might need them. At least for their benefit, kindly get to know these info. Particularly, if you open Azhagi+'s 'Settings' screen and tick certain options as shown in the screenshot below, the process of 'starting & using' Azhagi+ will become very easy for you. You can AutoStart Azhagi+ along with Windows and keep it as a small icon in the system tray, always. To know how to do this, please visit and see oper-plus.html#settings. In this way, if you make Azhagi+ auto-start along with Windows, then whenever you wish to type in other languages (or whenever you wish to keep typing alternately in English and other languages), the only thing you have to do is to just press an hotkey like Alt3. That's all. Too simple. Is it not? Is it that every time I have to navigate to Azhagi+'s folder and click on "Azhagi-Plus.exe" to start Azhagi+? No. Not necessary. You can create a Shortcut to "Azhagi-Plus.exe" in the desktop. Thereafter, it is enough if you click on the shortcut, to start Azhagi+. Please click here for more tips.